Motor : is similar to (Dry Type) Induction Motor, the only difference being the degree of protection (it is of IP 68 enclose – to ensure Hermetic Sealing even under water immersion). The Insulation is of Class 'F" or "H" yet the Design Temperature Rise is Restricted to Class "B" allowing excellent resistance to Insulation failures. The insulation is always Resin Rich, Vacuum Impregnated ensuring air bubble free varnishing. Motor Cooling : is by heat dissipation into surrounding water. 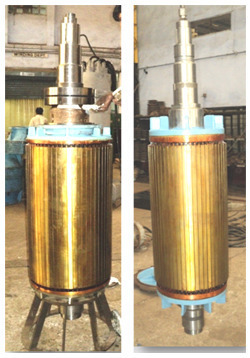 If motor submergence is not always possible, special open circuit Jacketing System is provided which uses a part of the Pumped water to cool the motor. Aqua is a leading Indian manufacturer of Heavy Duty Water Pumps & Wastewater pumps. Its products are thoroughly engineered withstand the less than Idealistic operating conditions often encountered in developing countries. Hence in real life conditions, they out perform equipment from the developed countries.